Sundal is one of those recipes originating from Southern India that is primarily prepared during festivities of Navratri. It is prepared as a part of ‘prasadam’. 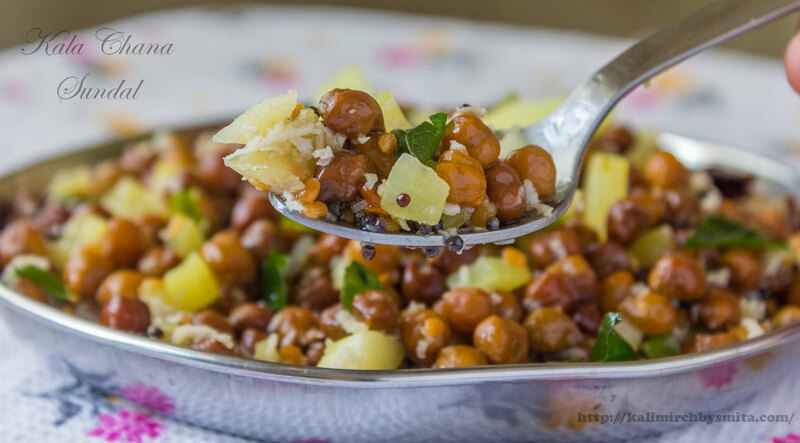 Different forms of legumes are used in this preparation which results into this dish having several variants like – White Chana Sundal, Green Peas Sundal, Horse Gram Sundal and many others. 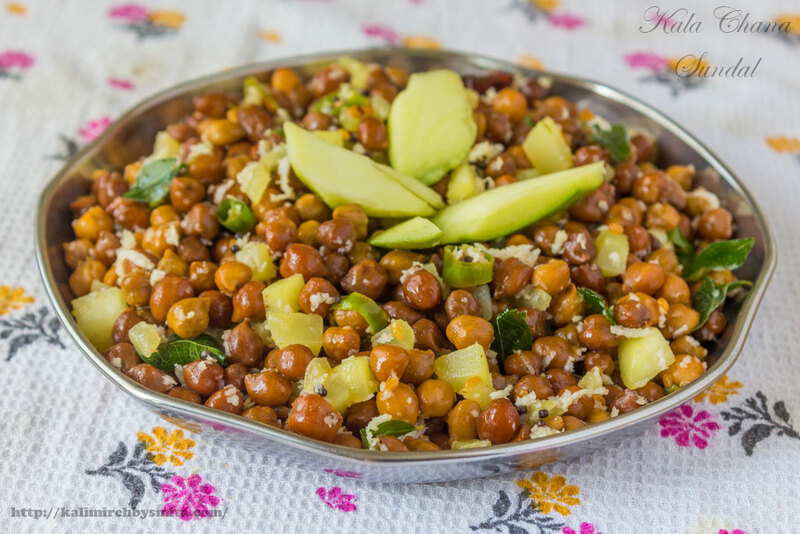 I often make this dish as it is one of the easiest to make for quick lunches or for those quick evening snack that you can carry in your tiffin box. You can store soaked and boiled dried brown chickpeas at the beginning of the week and use it for making this dish as and when required. We can fire up the spicy and tangy quotient of the dish by adding green chilies and raw mangoes. 150 grams Kala Chana (Dried Brown Chickpeas). Soak in water for 6 hours and then pressure cook on medium heat until 2 whistles. Heat 2 tbsp. Coconut Oil in a pan. Add Mustard Seeds, Asafoetida Powder, Split Black Lentils and Dried Red Chilies. Fry until Split Black Lentils turns light brown in color. Now add Curry Leaves. 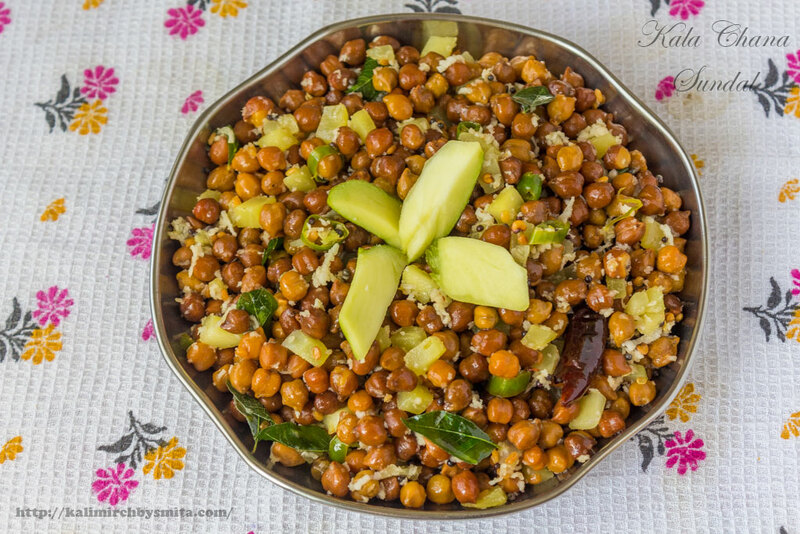 Add Boiled Chana (Brown Chickpeas), Green Chilies, Raw Mangoes and grated Coconut and mix well. Add Salt to taste and mix well. Add Lemon Juice. Mix the contents and take it off the heat. Kala Chana Sundal is ready to be served. Delicious Sundal is ready. Can be served as a quick snack. Mixed with steamed rice, it can be served as quick lunch.